All martyrs are special and they are our national assets. A society that forgets its martyrs is bound to be doomed. I said this umpteen number of times. This too holds true for a bimbo named Gurmehar Kaur and her martyred father. He was a brave heart and I have all the respect for him. I have no problem in saluting him and each one of them like him every day. My problem starts when such brave-hearts are dragged unnecessarily into political slug-feast for personal/electoral gain. It even becomes more flabbergasting when martyrs are politically pawned by their own, this time his own daughter. This is precisely why I called her a bimbo in the first line. I had unequivocally condemned the parents of PVC Vikram Batra when they tried to pawn their martyred son during 2014 general elections. You can read my counter here. Such nonchalance coming from the family is both disrespectful towards the martyr as well as our armed forces. So when Ms. Kaur stands up and tries to sell her father’s bravery to the political leeches, this time the notorious Commies, it falls upon me to stand up and call her bluff squarely. So here it is. Ms. Kaur, for starters, you shamed your father and I will tell you why and how. Here is the dirty fact Ms. Kaur, if you are not yet aware of the reason for the ruckus that engulfed Ramjas College four days back. For motives not quite known, the college invited Umer Khalid, a pig, charge sheeted for 'sedation' and treachery, to come and vomit his poison against the nation in an event. What are his achievements for this invite – open declaration of war against the nation and a voracious call for the ‘Tukde Of India’? FoE is at one place but accommodating outright traitors with known anti-national credentials is quite another. As such FoE comes with its own checks and balances. Such pigs and those who support him need to be thrashed and thrashed badly. Exactly what happened in Ramjas College. Before you had shown your uncanny love for pigs like Khalid, Ms. Kaur, I wish you had the minimalistic shame to have remembered your father’s bravery for once and how pigs like Khalid are majorly responsible for his martyrdom. These shameless parasites haven’t changed much. His father was a terrorist and this chap hasn’t shaded of that filthy gene. People like him are still hurling stones at our soldiers, even at the vehicles carrying critically wounded soldiers to the hospitals. You support such scoundrels, even there by taking your father’s name as an excuse? You not only are a bad citizen but you appear to be an extremely bad daughter too. But Ms. Kaur is just a symptom. She is a symptom of the filth that the Commie pigs have sowed deep within our education system. But that said a systematic study of this symptom need to be done since she has evoked a martyr’s name for her and those outlaws she supports, gain. Let’s look at the past of Ms. Kaur a bit. And the past suggests that, she is a seasoned placard warrior. This is not the first time that she has sold her father’s bravery. She had done it before too. When we debug a little on her earlier placard nonsense, her true colour comes to the fore. Her past also points at the reason why she is so shameless with her father’s legacy. There is this filthy congregation of louts that mostly constitutes the known Pakistani apologists. And this woman is a regular attendant in all such bogus ‘Love Pakistan, Love Pakistani’ events. 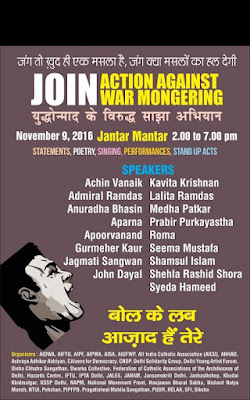 The events are organized by people like Jhon Dayal who has a long history of hate towards India and Hindus. Kavita Krishnan is another exponent of that group and we hardly require any rewinding to mark this noted Commie pig. There are other morons in that list, few even have the distinguished credentials of being in the invitee list of ISI sponsored anti India parties hosted by Gulam Nabi Fai. Just look at the list given in the bottom part. There are these Azadi gangs too. AISA, the Commie wing that houses traitors like Umer Khalid also feature in the list. Not to forget here, all these morons I named are flocked in the AAP gang as well. And these are the kind of deplorable flounders that Ms. Kaur regularly hobnobs and advocates their dirty anti-India ideology. Before one such event she even had a placard to her chest that read – Pakistan didn’t kill my father, war did. Fantastic!! She is so damn right. We in fact fought the Kargil war with aliens from another solar system. When the nation is still mourning the loss of our brave sons, a daughter has already exchanged her father’s bravery to pigs that are proven of their anti-India rhetoric and surviving on enemy money. And what made her to exchange her father’s bravery so cheaply? Well, we will get to that little later. 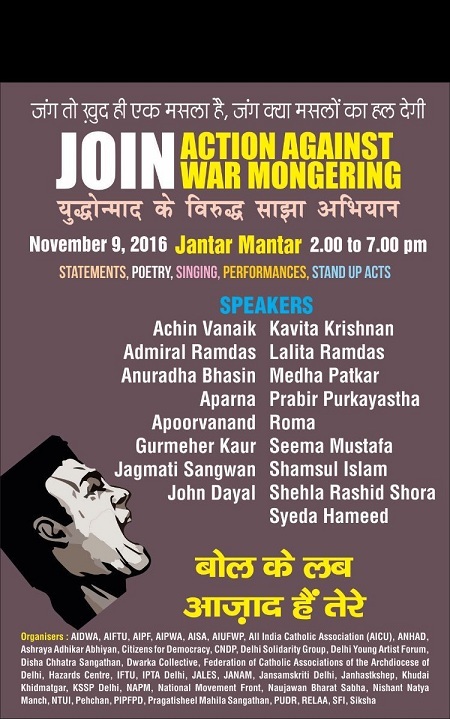 Post the Ramjas nonsense that the left wanted to orchestrate Ms. Kaur had her placards out again. This time she supported the Commies and called names of ABVP and proclaimed that entire student base of India are against ABVP’s attack on traitors. All students of India? Seriously? She seems to represent everyone out here. What a bluff that is? 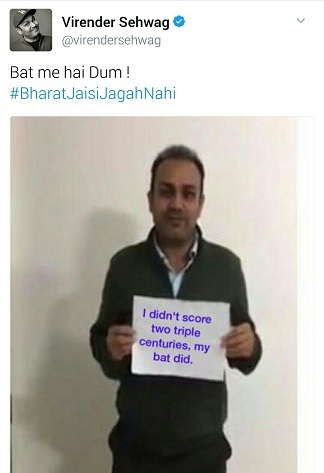 Virender Shewag tried to call her bluff and had his placards out too. That makes perfect sense to me. Kargil is something that was thrust upon us by Pakistan. We lost many of our soldiers because of Pakistan only. Someone coming out and giving clean chit to Pakistan for Kargil is demeaning our armed forces and the sacrifices they made in the hills. Such bluffs need to be called out loud and VS did exactly that. If Pakistan didn’t kill Ms. Kaur’s father but the war did then Shewag didn’t score the triple tons either. Hitler didn’t kill Jews too. Rightfully Randeep Hooda joined Shewag in calling the bluffs of Ms. Kaur. I don’t see any harm or problem here. But for some reason our Commie brigade are having their posteriors on fire. For them all of their nonsense is Freedom of expression but when someone else tries to execute his/her FoE they have a problem. In fact these bogus preachers of absolute puke worthy notions can’t tolerate anyone challenging their nauseate approach. They love their FoE, even if that means supporting traitors but others can’t have their views. This is the reason perhaps why an entire Commie lot from our media and other secular political outfit jumped out to bash both VS and RH. It started with the wheeler dealer. Coupta was all over the place. This is how it pans out in Commie circles. For some reason a martyred father seems to have given all the liberty to the daughter to run around delivering garbage. 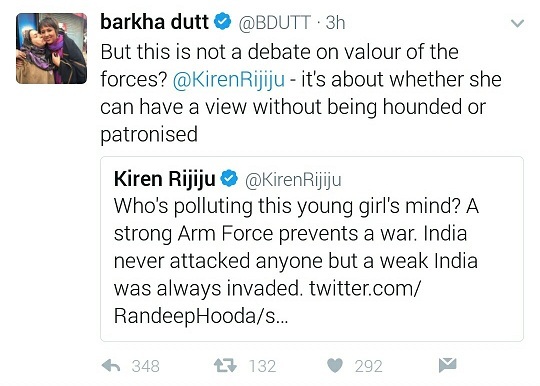 Even more interesting, none can oppose her views since her father is a martyr. At least that is what Coupta suggests. 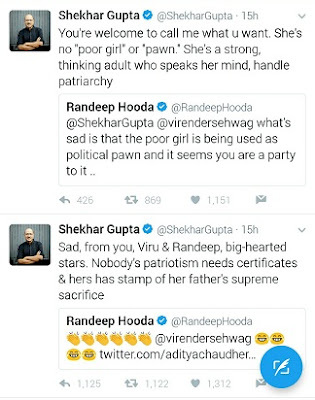 According to him Ms. Kaur’s patriotism is stamped while people like VS or RH don’t have anything to their credit to call her bluff. Randeep Hooda picked this age old phoney quite beautifully. People like Coupta and his brethren are long using gullible citizens for their own agenda. Notorious Commie exponents in public life in connivance with their political masters have used everything at their disposal for their political cause. Single aim is to oppose BJP and Modi in every step. This is the reason why they latch onto anything that they feel can make some noise against BJP. This is precisely why they rallied behind traitors like Umer Khalid, Kanheiya Kumar and Hardik Patel. But they aren’t that supportive when someone stands up and opposes their views. FoE of those who oppose rotten Commie ideology of hate and bigotry doesn’t find their kind love. In fact they start hounding the individual. Not long back a fifteen year old girl challenged the Commie morons like Umer Khalid and Kanheiya Kumar for an open debate. At that time it is people like Coupta and other sundry freeloaders that traumatized the small kid with their bile. I never saw a single fiberal crying for the FoE of that teenager. But today when this girl is here to trade her own father for political reasons the Commies are all around crying victimhood. And remember, Ms. Kaur and her views are anything but neutral. Her association with Commie warehouses like AAP are no secret. Kiran Rijiju was correct with his apprehensions. This is shocking to see a young girl dishing out anti-India sentiments and siding with people who have sedition charges against them. This is how our education system has gone to dogs, thanks to these Commie fiberals and their absurd hate mongering for their own country. But the ‘Radia Tape’ finds nothing amiss with the girl. She rather questions KR. This is how the Commies possess a blind spot; reason why they feel they can play the victim card and yet no one would pick their nonsense. BD asks if Ms. Kaur can have her views or not. What a sham of a question is this? Who on earth is questioning her right to have views? It is she who brought her martyred father to play the emotional card but when one points that out it becomes a problem. This is nothing new with these Commies. A shameless daughter thinks of trading her father’s legacy for her political masters but when someone asks why she is auctioning her father’s legacy so cheap, it becomes witch hunting. Ms. Kaur enjoys her right to views as much as Shewag or Randeep Hooda enjoy but Commies only want to see and hear their side of the story. They can take all the liberty to call names but aren’t ready for counter views. They are so unionistic towards opposing views that they can’t even tolerate if someone shows his/her dismay on the developments. 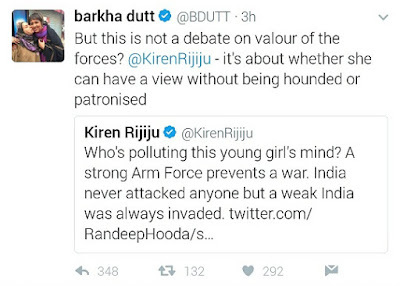 Just because her father is a martyr it seems rest all cease to enjoy their FoE in opposing her views against India. What kind of logic is this? In which world these Commie morons are living? You can’t leave Congress much behind in supporting the Commie agendas. People who introduced 66A to suppress the voices of the land so that the first family could be shielded from public scrutiny would be the first ones to vouch for FoE. They even are masters at finding saffron connection in everything. Randeep Hooda’s mother being a part of BJP automatically makes his views repulsive. Ms. Kaur can use her father’s name to stand against the nation but RH can’t oppose since his mother belongs to BJP. They live in their own theory of ‘culprit by association’ but seldom apply the same rule to themselves. Robert Vadra’s loot can’t be attached to Sonia Gandhi as he is a private citizen but RH having his views is same as that of the views of BJP. This is what FoE stands for these Commie morons today. It is one way street where only filthy Commie ideology is allowed to pass through. If questioned, it becomes hounding of free speech. Ravish Kumar’s brother engaging in running a prostitution racket can’t be attributed to this media crook but RH need to be questioned of his mother’s political association. And yet, they have a problem if one lays out the ‘Raincoat’ metaphor. They run around Teflon coating their own chumps but don’t show similar charity with others. Every one’s views seem to have an agenda except of those belonging to the Commie brigade. This is what defines FoE for these rascals. But here is a simple fact – universities and colleges are places for studies, not to engage in political bigotry. For long our educational institutes are been taken hostage by these Commie frauds and they are pushing their anti-India sentiments with all force; case in point, Ms. Kaur. When she should be studying, she rather is busy tweeting and hopping TV studios for SoundBits. Things need to be resurrected. I won’t mind at all if all kind of political nonsense is totally banned in our institutes. No kind of political skulduggery should be allowed inside our campuses. This will also flush out charlatans like Umer Khalid or Kanheiya Kumar from continuing doing their shoddy PHd/MPhil for donkey’s years on tax payer’s money while in reality are only interested in dirty politics. By the way, it may not be that important, but as per army records Ms. Kaur’s father didn’t die in Kargil war but he was killed by terrorists in Kashmir. And sad, his daughter is shouting alongside the very people who killed her father. And worse even, she is using her father’s name with liberty so that she can gather some sympathy. Sorry to say this but she is a bad, bad daughter.